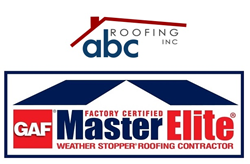 ABC Roofing, Inc. is proud to announce their selection as a GAF Master Elite Roofing Contractor positioning the Greensboro, NC roofing company among the nation’s top three percent in the industry. At ABC Roofing, Inc., we are committed to top-notch quality and unbeatable customer service – our reputation in the Winston Salem community depends on it! – Greg Flury, President, ABC Roofing, Inc.
ABC Roofing, Inc. (http://www.ncroofingcontractor.com/) is proud to announce their selection as a GAF Master Elite Roofing Contractor positioning the Greensboro, NC roofing company among the nation’s top three percent in the industry. Roofers selected by GAF for Master Elite Status, must adhere to the gold standard of quality and service including maintaining the required state insurance and licensing, an excellent reputation, and a total commitment to continuing industry education and training. Central North Carolina residents can rely on ABC’s GAF ranking for quality services and products delivered on time by knowledgeable, trained professionals. ABC Roofing was founded in Greensboro, NC, to offer dependable, quality services for businesses and homeowners. The company quickly became known for integrity and honesty, coupled with top-quality service, earning a reputation for excellence in the roofing industry. –Greg Flury, President, ABC Roofing, Inc.
ABC Roofing, Inc. proudly serves friends and neighbors in the greater Greensboro region including Winston-Salem, Kernersville, Rural Hall, Walkertown, Welcome, Clemmons, and the surrounding communities delivering premium roofing products with exceptional services and affordable pricing. Along with superior Greensboro roofing services, ABC Roofing provides the best in gutters, gutter covers, siding, windows, skylights, decks, and sunrooms. In addition to GAF Master Roofing status, ABC is A+ Better Business Bureau accredited and the recipient of the Angie’s List Superior Service status. “At ABC Roofing, Inc., we are committed to top-notch quality and unbeatable customer service – our reputation in the Winston Salem community depends on it!” – Greg Flury, President, ABC Roofing, Inc.
ABC Roofing, Inc. was founded in 2006 by Greg Flury on the principle of delivering quality products and craftsmanship with honest service from an experienced professional crew. Today the goal remains the same, superior products, expert services, honest and respect on every project. Rural Hall, Walkertown, Welcome, Clemmons, Lewisville, Kernersville, and the surrounding areas for 10 years specializing in residential and commercial roofing, gutters, gutter covers, siding, windows, skylights, decks, and sunrooms. Each and every project is completed with premium products, exceptional service and superior craftsmanship and backed by manufacturer and ABC’s own warranty.